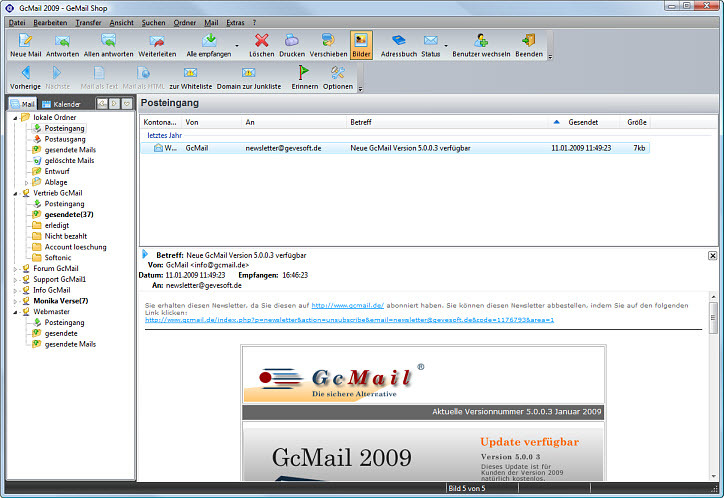 GcMail is a very flexible Mailclient which offers a great variety of configuration options, yet is easy to use.GcMail is a program which is suitable for the casual user, as well as the "Power- User" in an office environment. Clear layout, ease of use and security were priorities in the development of the program. As far as security is concerned, GcMail excels. You can use the integrated GcMail encryption option, if the recipient also uses GcMail. GcMail is a very flexible Mailclient, offers varieties of configuration options. ...... Alternatively, you can encrypt your confidential messages with PGP. Qweas is providing links to GcMail 6.0.1.0 as a courtesy, and makes no representations regarding GcMail or any other applications or any information related thereto. Any questions, complaints or claims regarding this application GcMail 6.0.1.0 must be directed to the appropriate software vendor. You may click the publisher link of GcMail on the top of this page to get more details about the vendor.